Compare discounts for Hotels Motels Resorts in Scottsdale, Arizona! 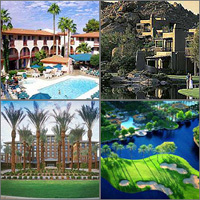 Located in the heart of the Phoenix Metropolitan area, Scottsdale is the crown jewel of the 'The Valley of the Sun'. The western-style shops of Old Town sit side-by-side with the new face of Fashion Square, Scottsdale's premiere shopping mall. The tourist resort row of north Scottsdale Road features world-class upscale resorts and golf clubs. The warm Arizona sunshine, golf, relaxation, shopping and nightlife options and the unmatched beauty of the Arizona desert sunset make Scottsdale a prime vacation destination.